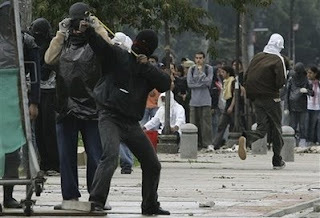 Bogota, Colombia - Police attempted to enter the grounds of the Bogota National University during a tuition protest, but were repelled by students armed with rocks and slingshots. Police employed teargas and a water cannon against the demonstrators who were estimated to be a thousand people strong. Yesterdays' protest was in response to a proposal to privatize the school, and begin charging tuition, though historically the school has been free and publicly-owned. At least one demonstrator and three riot cops were seriously injured.